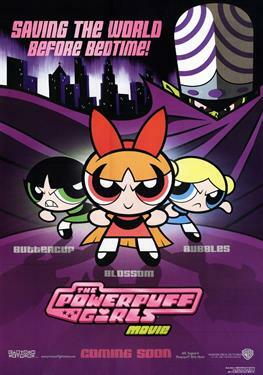 Blossom, Bubbles, and Buttercup--better known as the Powerpuff Girls--reveal the story of how they came to be the official protectors of the City of Townsville. When Professor Utonium first cooked up the Girls in his laboratory, he wasn't trying to give them superpowers. But when the Professor's mischievous monkey lab assistant Jojo knocked a dose of Chemical X into the mix, the Powerpuff Girls were born. While they have such powers as laser beam eyes, superhuman strength and the ability to fly at the speed of light, the Girls are only in Kindergarten. Although they don't mean to hurt anyone, their natural playfulness, coupled with their unnatural abilities, leads to some not-so-natural disasters and earns them the hatred of every man, woman and child in the city of Townsville. The girls are despondent, believing that their powers are evil and nobody loves them. Then Jojo slinks back onto the scene--but the Chemical X-plosion has mutated him into the evil genius Mojo Jojo. He convinces the Girls that he understands the pain of being an outsider, and lets them in on a plan that will endear them to all the people of Townsville--they will build a Help-the-Town-and-Make-it-a-Better-Place-Machine. The Girls immediately set to work gathering the necessary materials from all over the world. But what the Girls don't know is that Mojo Jojo has no intention of making Townsville a better place. In fact, he's planning on using the machine for his own nefarious purposes. Will the Girls realize the truth about Mojo as well as the true potential of their powers in time to really help the town and make it a better place?